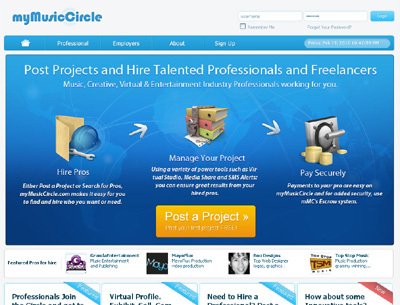 myMusicCircle enables professionals, students and freelancers to be instantly accessable to thousands of potential clients and opportunities. All you have to do is create your profile, and submit bids to posted projects. Also, it allows Employers looking to hire professionals in the music industry a one stop shop to find and hire talented professionals and freelancers in the music industry. Is to help reach the next phase of the music evolution. We feel that music should unite our experts in the industry. And being that the industry is divided today; we want to bring it together because we feel that power comes through union. Our tools, digital workflows and concepts in the myMusicCircle model will enable business relationships to come together as well as empower our professionals to see new streams of revenues by putting to full use these innovative tools. And all for the end of results of helping new and experienced professionals with a platform where they can continue to deliver quality to the music industry and those who consume it.